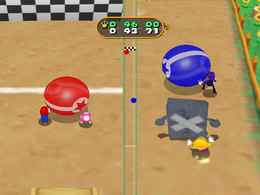 Sphere Factor is a 2-vs-2 minigame in Mario Party 7. It returns in Mario Party: The Top 100 where the ball rolls much faster than it did in the original. Its name is a pun on the reality show Fear Factor, as was the name of the Mario Party 6 minigame, Pier Factor. The camera focuses on the goal line, then pans to the players. 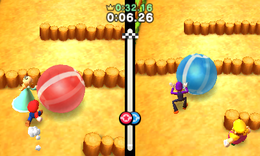 The object of the minigame is for each pair to get their giant ball to the goal. The ball must be pushed around and through many obstacles, which include mini-mazes, Monty Moles, Whomps, and a bridge that's particularly hard to get over. If the ball falls off the bridge, it needs to pushed up a steep hill. Rules – "Help your partner roll the giant ball to the goal. First team across is the winner!" Advice – "Try to cross the wooden bridge and avoid the dip. If you fall into it, you'll lose time." Description – "Push the ball as a team and roll it through the obstacles to the goal!" On-screen – "Roll the ball to the goal!" Oshite! Tamakorogashi Push the Rolling Ball! Flatiator shares the same French name. This page was last edited on April 8, 2019, at 13:10.